While your engine is important, transmission issues are among the most serious and dangerous aspects to take care of on your car immediately. AAMCO of Turnersville takes the time to thoroughly diagnose all transmission problems before beginning work on your car. This ensures us to complete the repair quickly and efficiently the first time. You can count on our state-of-the-art diagnostic technology and equipment and many years of experience to pinpoint the issue and provide prompt repair to get you back on the road as quickly and as safely as possible. If you are noticing gears slipping, strange noises coming from under your hood, burning smells, grinding noises, or leaking fluid, you may have an issue with your transmission. Bring it in today to let our expert technicians take a look. When you bring your car into AAMCO of Turnersville, you can expect only the most rigorous and detail-orientated service from our technicians. A full transmission check can take about 90 minutes. Throughout this process, our experienced technicians scrutinize every component of your transmission to make sure you’re safe on the road. You can expect your car to be returned to you in optimal condition. Our exclusive transmission scan process checks for a multitude of issues and conditions of your vehicle. 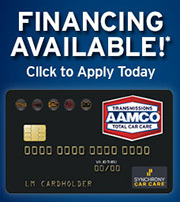 Not only does AAMCO of Turnersville check this extensive list of systems in your transmission, but your vehicle’s computer system as well. Newer vehicles rely heavily on their computer for gear shifting, assisted braking, gas mixture delivered to the engine, and much more. We provide advanced computer diagnostics while working on your vehicle to match the physical checks to restore your care to the perfect working condition. Using AAMCO’s Computer diagnostics and Kwiktes PlusBox, we are able to retrieve codes issued by your car that help us pinpoint the issue and repair it more efficiently, saving you on parts and labor costs. When your car issues a code to use, we compare that data with our extensive AAMCO database and quickly find the solution. Never be charged for incorrect diagnostics or repairs ever again! Call today to schedule an appointment for state-of-the-art diagnostics that help you get back on the road quicker and more cost-effectively.